Rivers and canals are very special green spaces, but they are not always accessible for all to enjoy. 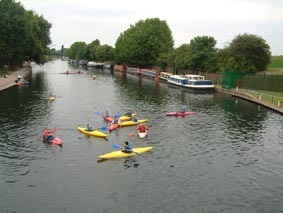 This is the story of how Orthodox Jewish boys and girls came to participate in river-based activities on the River Lea in London's Stamford Hill. A group of boys showed initiative and asked to learn rowing. Sensitive consultation then helped to raise awareness and build trust between the ethnic minority Jewish community and the gentile run sports clubs. A river-based art project by the local Jewish Girls' school inspired pupils to develop design ideas and gain a sense of ownership of the waterside environment. It is hoped that this will lead on to further community involvement in river-based recreation and amenity.